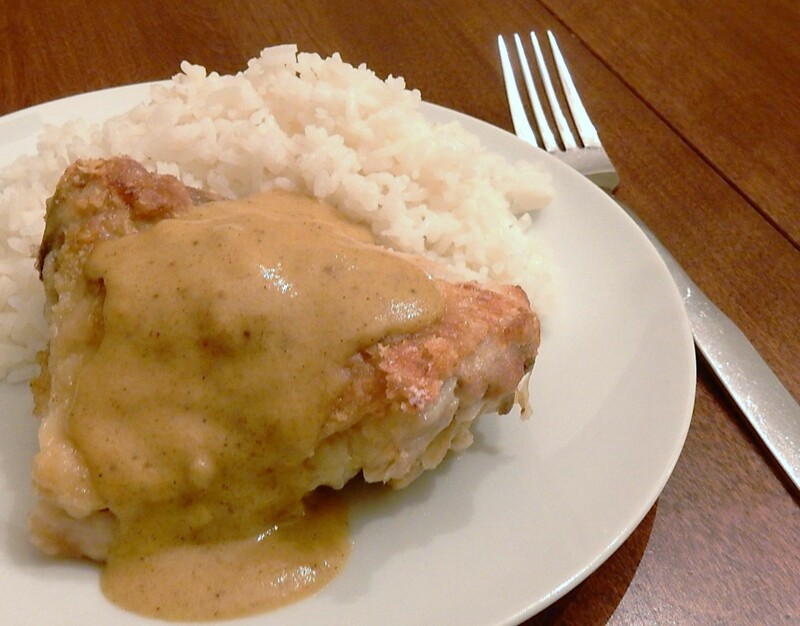 I recently made a hundred-year-old recipe for Curried Chicken. The recipe turned out wonderfully. The crispy chicken is served with rice and a delightful mild curry sauce that has just a hint of sweetness. This recipe is a keeper, and I’m sure that I’ll make it again. The careful housewife fully understands that her success in cooking absolutely depends upon the quality of the ingredients she chooses. A variable cooking fat like lard, often having unpleasant odor and flavor, cannot give the pleasing, appetizing results insured by a clean, pure, tasteless , odorless, uniform fat like Crisco. Dip chicken pieces in water, then roll in 1/2 cup of flour to coat. Heat shortening in a frying pan using medium heat. Stir 1/2 teaspoon salt to the melted shortening. Place the coated chicken pieces in frying pan and cook until lightly browned. Turn the chicken to brown all sides. In the meantime, preheat oven to 400° F. Line a baking sheet with foil, then put the pieces of browned chicken on baking sheet and place in oven. Bake until the chicken is completely cooked. After the chicken is removed from the frying pan, strain the shortening. Return 3 tablespoons of shortening to the frying pan; then reheat using medium heat. (The remainder of the shortening can be discarded or used for another purpose.) Add sliced onions and stir occasionally; cook until lightly browned. Stir in 3 tablespoons flour, curry powder, paprika, and 1/2 teaspoon of salt. Continue stirring until hot and bubbly, then gradually add milk and cream while stirring constantly. Continue stirring until the mixture comes to a boil. Add currant jelly and lemon juice; stir until the jelly is dissolved. Removed from heat and strain. Serve the sauce with the chicken pieces and rice. 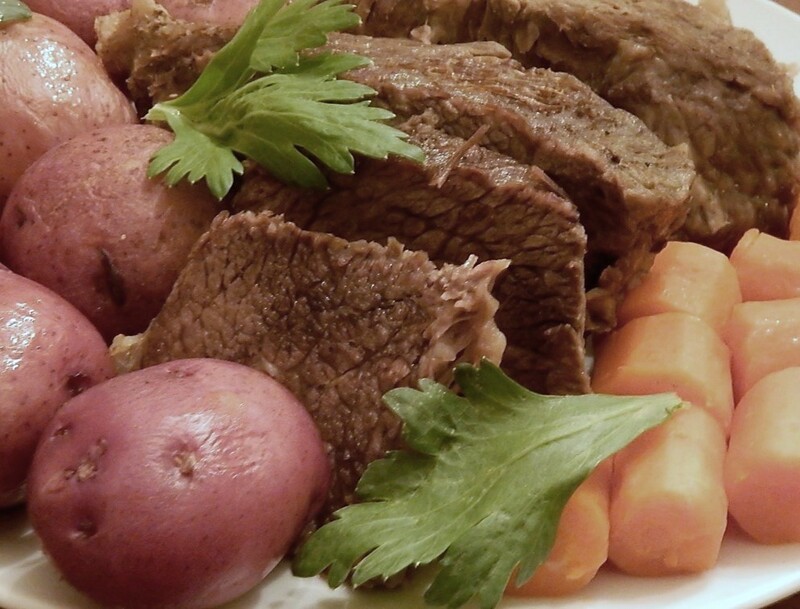 On these cold January days, Pot Roast with Potatoes, Onions, and Carrots is the classic comfort food. I used a hundred-year-old recipe to make this dish, and it was just as tasty now as it was a century ago. Put the chuck roast in a dutch oven with 1 cup water; using high heat, bring to a boil. Reduce heat and simmer for 1 1/2 hours. Turn several times while cooking; add additional water as needed. Add potatoes, onions, carrots, salt, paprika, and 2 cups water. Cook for an additional 40 minutes. 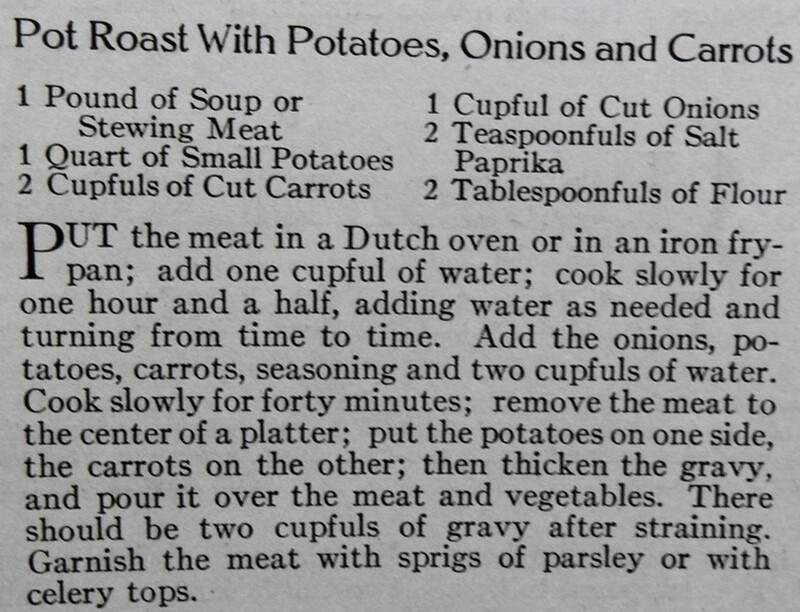 Put meat on a serving platter, then put the potatoes on one side of the meat and the carrots on the other. Put onions in a small bowl, and serve on the side. Put the flour in a small bowl. While stirring constantly, slowly add 1/4 cup of water to make a smooth paste. Bring the meat broth back to a boil, then stir in the flour slurry. Stir constantly until the mixture has thickened. Remove from heat. The gravy may be poured over the meat and vegetables, or served on the side. Garnish with sprigs of parsley or celery leaves. 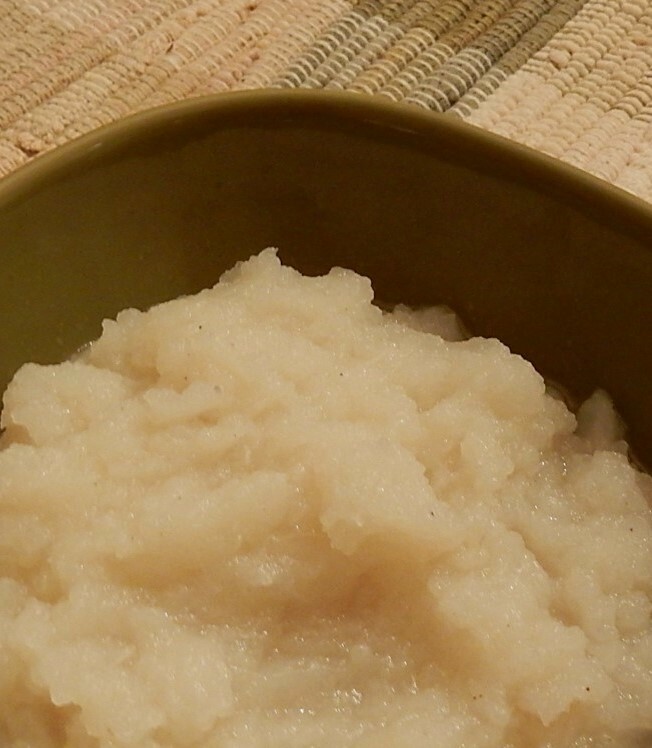 Hundred-year-old Christmas menus sometimes included Mashed Turnips as a vegetable side dish, so I was pleased to find a 1918 recipe for Mashed Turnips. This rustic side dish has a delightful earthly, sweet, yet slightly bitter, flavor. Wash and peel turnips; cut into slices or quarters. Put in a saucepan and cover with water; add salt. Using high heat bring to a boil, then reduce heat, and simmer until turnips are tender (approximately 35 – 45 minutes). Remove from heat and drain. Mash the cooked turnips, then stir in pepper and butter. Serve immediately. Are there some types of cookies that immediately bring back warm, fuzzy memories of childhood. Well, for me, Sand Tarts are that cookie. This thin, crispy cookie is my all-time favorite. My mother never made them (I’m not sure why. ), so I was always thrilled when they were on a cookie tray at church or a friend’s house. Preheat oven to 350° F. Put cinnamon and 1/2 cup sugar in a small bowl; stir to combine, then set aside. Cream the shortening; beat in the 2 cups of sugar, and the whole egg and yolk. Then stir in the flour and salt. The dough will be crumbly, but will cling together when pressed together. Place the dough on a lightly floured surface, and knead until smooth. Roll out dough out until it is very thin (1/8 inch thick). Cut into rounds or, if desired, other shapes; and place on a greased cookie sheet. 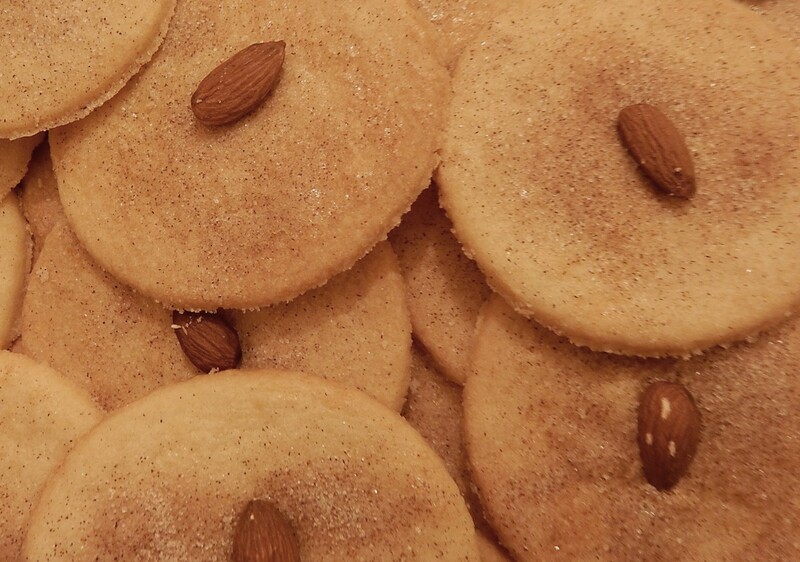 Brush cookies with the egg-white, then sprinkle with the cinnamon and sugar mixture. 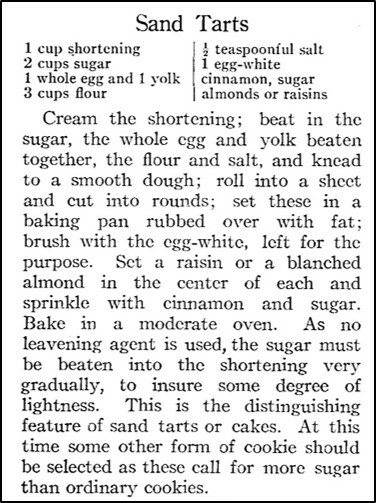 Set an almond or raisin in the center of each cookie. Cut into desired shapes. Place on greased cookie sheets. Bake 8-12 minutes or until lightly browned. The recipes in specialty cookbooks focused on specific ingredients are often hit or miss. The authors sometimes get so focused on using certain ingredients that taste is lost. So I had a bit of trepidation when I recently came across a cookbook published in 1918 called The Corn Cook Book: War Edition by Elizabeth O. Hiller. This cookbook was written during World War I when wheat flour was in short supply, so Ms. Hiller sought to help cooks, “save the wheat” by using corn. 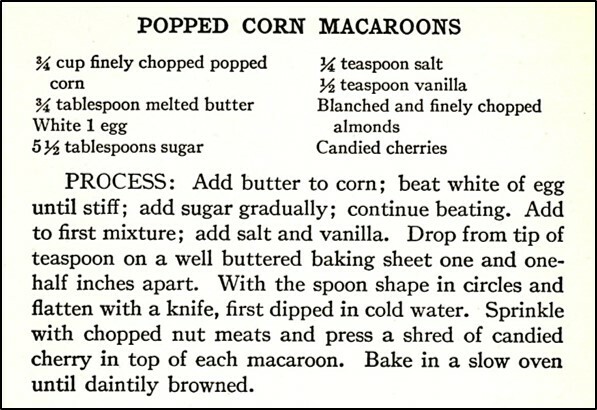 I was drawn to a recipe for Popped Corn Macaroons. I was intrigued by idea of using pop corn to make macaroons, and I liked that it was a gluten-free recipe. The verdict: Popped Corn Macaroons are light and delightful. They have a nice balance of sweetness and saltiness that works well with the popped corn. And, Popped Corn Macaroons are very attractive with each topped with a piece of candied cherry. This recipe is a keeper, and I’ll definitely make it again. Stir melted butter into the chopped popped corn, set aside. Preheat oven to 325° F. In a medium mixing bowl, beat egg white until stiff peaks form. Gradually add the sugar while continuing to beat. Stir in the vanilla and salt, followed by the popped corn. Line a baking sheet with parchment paper. (It is important to use parchment paper. I had problems with the macaroons sticking to the baking sheet when I did not use it, so remade the recipe using parchment paper and it worked much better.) Drop heaping teaspoons of the mixture on the baking sheet. Space 1 1/2 inches apart. Then shape into a circle and flatten with the back of a spoon or a knife. (Spoon or knife can be dipped in cold water before shaping and flattening, if there are problems with the dough sticking.) 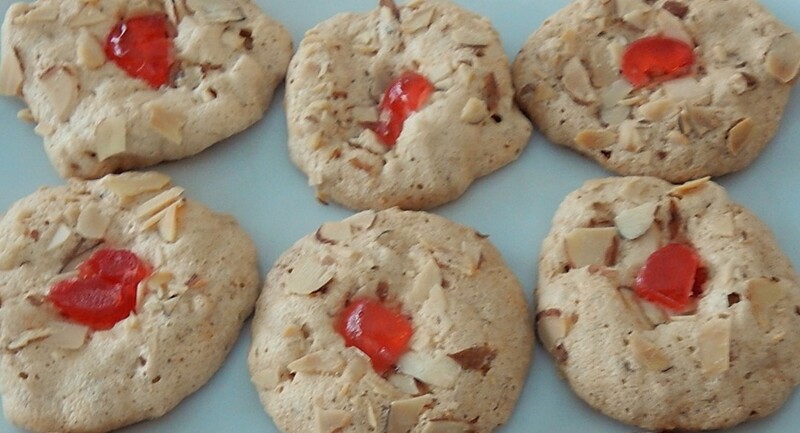 Sprinkle with chopped almonds, and then press a piece of candied cherry in the center. Bake approximately 25 minutes or until the macaroons are lightly browned. Similarly to what we believe today, people a hundred year ago believed that healthy eating was important, and that good nutrition could support their health. 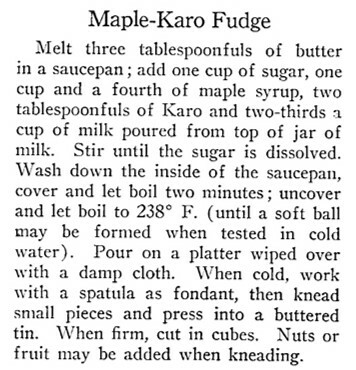 A 1918 cookbook called the Nature Cure Cook Book is chock full of health advice and interesting recipes. The recipe for Fruit Omelette intrigued me. Eggs and fruit are both nutritious foods, but I’d never before seen them combined in an omelette. This recipe offers lots of options. It can be made using “apple sauce, stewed pears, peaches, plums, berries, raisins, etc.” or, as indicated in the note at the end of the recipe, grated apples. And, either cinnamon or nutmeg could be used to season the omelette. I decided to go with the grated apple option and cinnamon. 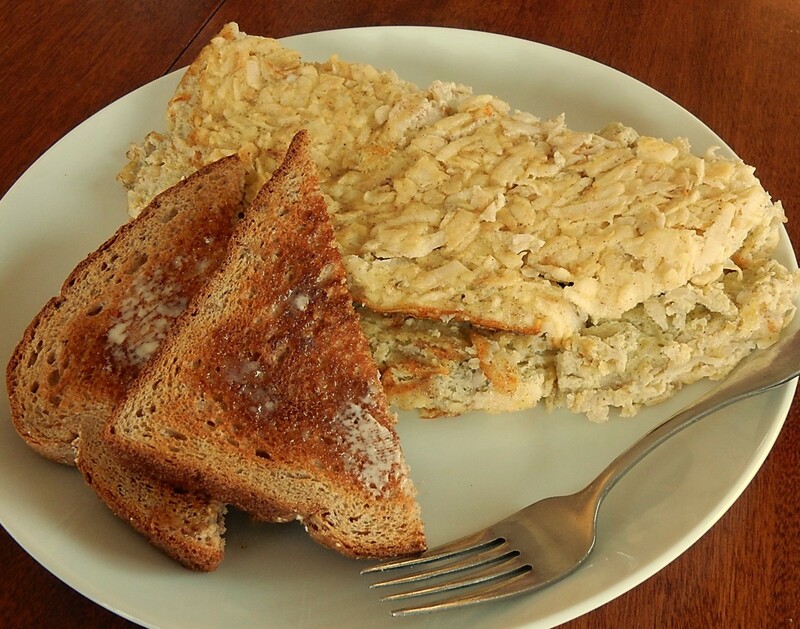 I served Grated Apple Omelette at breakfast – though it had a dessert-like essence. The omelette had a nice cinnamon-apple flavor, and the liquid from the grated apples combined with the eggs during baking to create an omelette with a custard-like texture. 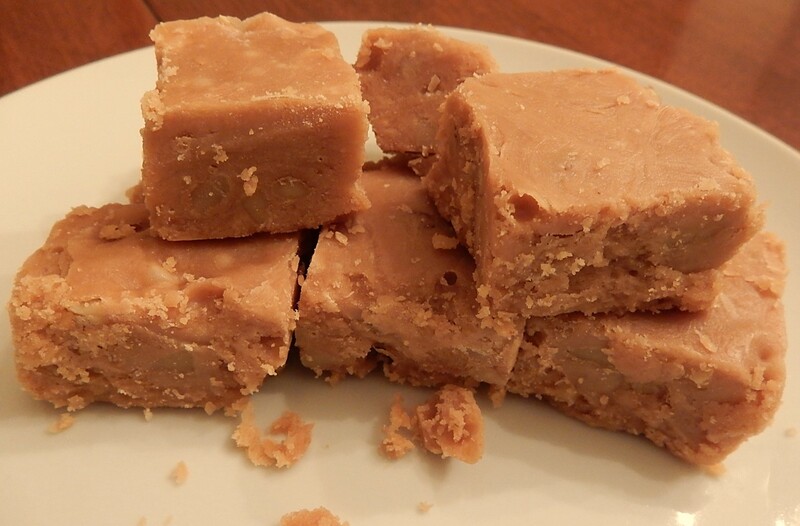 The old recipe calls for “sugar to taste.” I used two tablespoons of sugar when I made the recipe – though I think that it would work just fine to skip the sugar. Put eggs in mixing bowl, and beat until light and foamy. Add butter, sugar, and cinnamon; beat until combined. Then stir in grated apples. Put egg mixture in a well-greased oven-proof skillet. Put in oven and bake until the eggs are set (approximately 20 minutes). Remove from oven, loosen the edges with a knife or spatula, then gently flip or slide onto a plate. Fold in half to create the omelette. To make the most visually appealing omelette, it should be folded so that the side which was facing up when in the pan is on the outside of the finished omelette. Cook’s note: Care must be used when removing omelette from pan and when folding to keep it all in one piece.